If you’re looking around for a Honda dealership near Mechanicstown, NY, stop by Middletown Honda and check out the 2013 Honda Pilot, part of our great selection of vehicles. We’re just minutes away, at the junction of Highway 17 and Highway 211. The Honda Pilot has certainly earned a reputation for itself as a leader in power, fuel economy, and affordability in an auto market that finds these traits sorely lacking in the SUV segment. While both the Honda Pilot and the Toyota Highlander have similar engines, the Pilot offers more torque, making it easier to get off the line with 253 lb-ft of torque to the Toyota’s 248 lb-ft. According to Environmental Protection Agency estimates, 4WD models of the 2013 Pilot can also save you on gas by getting 24 mpg on the highway compared to the Highlander’s 22 highway mpg. * The Honda also comes with a limited slip differential and a locking rear differential, both not available on the Highlander. 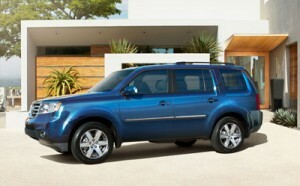 For 2013, the Honda Pilot comes standard with some great features to make your drive more comfortable, whether it’s short or long. The dual zone, automatic climate control is a feature that’s not available on the Toyota. Honda also includes four front power outlets where the Toyota only has three. The Pilot also has the very convenient parking assist feature to help avoid fender benders when sliding into a tight spot. Come check out this newest Honda sport utility vehicle at our showroom in Middletown. We’ve got a huge selection of new and used cars and we’re happy to help you find the right one to fit your lifestyle. Don’t just take our word for it, though. See what our customers have to say, and then come down and discover the Middletown Honda experience for yourself.